WILLEMSTAD - Considerable effort has been made to balance the 2018 budget, however the multi-year budgetary problem of Curaçao still is reason for concern. The country does not yet have its financial management in order. Cft has therefore agreed with the government on how to achieve sustainable public finances. Based on documents provided by Curaçao (budget amendment and execution report), the Cft stated earlier that the 2018 budget no longer met the standards laid down in the Kingdom Act on financial supervision. In the process during which both sides are heard (hoor en wederhoor), the Minister of Finance presented additional measures and submitted new information. The Cft concluded nevertheless that there are still uncertainties about the claim on state-owned UTS, the risks surrounding Sehos and HNO and the fact that - more generally - ad hoc measures cannot solve the structural financial problems of the country. An important prerequisite is that the financial management is brought up to standard and kept that way. Without proper financial management, an orderly budget process is not attainable. The (ultimate) proof is the timely adoption of the financial statements with an unqualified auditors' report. It has been agreed that the government of Curaçao will ensure that this will be the case with the 2021 financial statements. A roadmap will be developed and adopted for the next two years. The implementation of said roadmap will be made possible by rapidly and drastically strengthening the financial column of the government apparatus. Furthermore, agreements have been made about better levying and collecting taxes, and about tax reform. Raymond Gradus, chairman of the Cft: “Strengthening the economy of Curaçao mainly requires private investments. Private investors want to reduce their risks and be able to rely on the stability and quality of the civil service and government administration. A necessary condition for this is solid management of public finances.” About the agreements made he states: “It is now up to the government to implement these decisively and energetically. As Cft we will follow this meticulously.” The Cft will inform the Council of Ministers of the Kingdom about the measures taken by the government and the agreements made with the Cft. 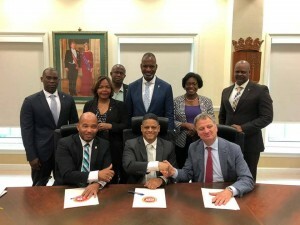 During its visit to Curaçao, Cft met with the Governor, the Council of Ministers, the Minister of Finance, the financial committee of the States, the ministerial director and supervisor (Ministeriële Regisseur en Toezichthouder) for the new hospital, the management of the central bank and the management of the refinery. It was the first visit of the new Cft members Henk Kamp (on behalf of the Netherlands) and Russell Voges (on behalf of Sint Maarten). The other members to form part of the Board are chairman Raymond Gradus and Gregory Damoen (on behalf of Curaçao).